~ by admin on Jun 16, 2009. 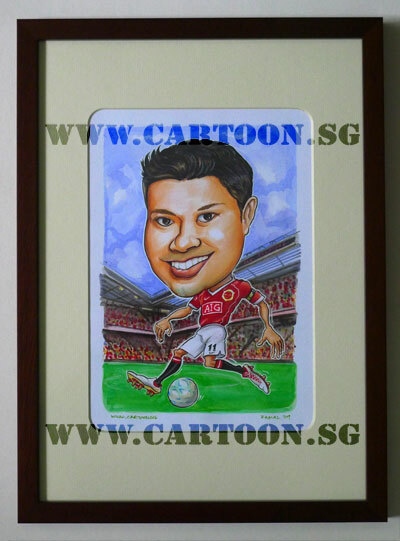 We were happy to finally receive an order for a soccer theme caricature. Oddly, we’ve drawn lots of American football and rugby but not a specific soccer team request this year. Soccer is popular here, especially English Premier League. 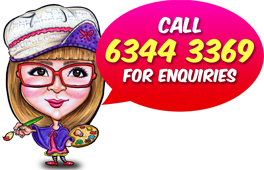 As luck would have it, a nice Malay lady contacted us. She wanted a surprise birthday gift for her husband. We threw in the Old Trafford stadium for this Manchester United fan who’s favourite player is the true reds, Ryan Giggs wearing number eleven. 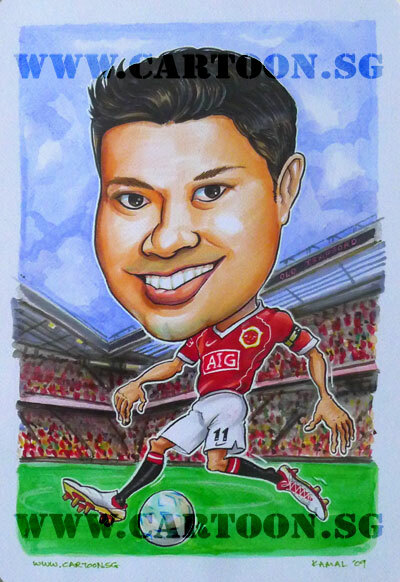 Those Liverpool fans in our office were upset over how gorgeous this birthday gift caricature turned out. And to top that we had it framed with rounded corner for the window mounted matt board. wld definitely love to get one frm u again soon… tk cr!